A presidential ticket with Al Capone and “Don” Corleone could actually happen based on the current state of moral values in this country. Lying, cheating, and lawlessness is just another day in the life of an American politician… and we accept it. We actually accept it. Mr. Obama’s approval rating is 53%. We have 95 million Americans out of work, 13 million more Americans on food stamps than when Obama took office, and the lowest labor participation rate since the 1970’s. It’s the worst economic recovery since the 1940’s. Home ownership is at it’s lowest rate in 51 years. Health insurance premiums are skyrocketing because of Obama’s signature legislation. Our military is weak, the economy is propped up, and I can’t see my doctor! UNREAL… I imagine if the economy would actually tank and the banks close, Obama would be closer to a 100% approval rating! FBI Director James Comey affirmed that Mrs. Clinton lied about, EVERYTHING! Mr. Comey stated, “Our investigation found that there was classified information sent.” That’s ILLEGAL! When Rep. Trey Gowdy asked if Mrs. Clinton stated there was nothing marked classified in her emails, Mr. Comey said, “That’s Not True”, “There was classified information emailed” TREASON! Guilty! Comey also said Clinton lied about only using one device. He verified that she used several, up to 4, devices. Once again she lied without even blinking! She claimed all work related emails were returned. Comey verified that was not true. They found thousands of work related emails that were not returned. Clinton said neither she nor her staff deleted work related emails. Comey said “We found traces of deleted work related emails.” Clinton said her lawyers read and went through every email. Comey said NOT TRUE! Clinton is a former First Lady, a former United States Senator, and a former Secretary of State. She used unsecured servers to send classified information around. She didn’t recognize an everyday symbol placed on documents to show that they were classified and even if she missed it, wasn’t she aware enough to know that they were sensitive? I’m sorry!? And she says Trump can’t be trusted with classified information? The meds must be affecting her. The FBI took over a year to look at 33,000 emails, yet just this past weekend decided that there were no issues with the almost 650 THOUSAND emails found on Anthony Weiner’s machine that was used by his wife to receive, store, and print government emails! Mrs. Clinton wants your vote. Mrs. Clinton has lied about almost everything to cover her illegal and unethical tracks. She has a history and a lifestyle of deceit. She was removed from House Judiciary Committee as a staffer for lying and incompetence. Covered up her husband’s sexual assaults and rapes and berated the women who accused him. Failure to tell the truth about Libya to the parents of the dead Americans. Went from “dead broke” to a 1%er after the Clinton Foundation was formed. Husband’s speaking fees tripled after she became Secretary of State. I could fill pages with this stuff. Some of you on the Left either really believe that all these issues are false. They’re pushed by a Right-wing agenda. Or maybe they could be true, you just don’t care… at least they are not Republicans! In speaking with some of you I am shocked to hear you say all politicians are corrupt and that they need to act like this to make it in politics. AND ignore whatever evidence is being reported, she hasn’t been convicted of anything! 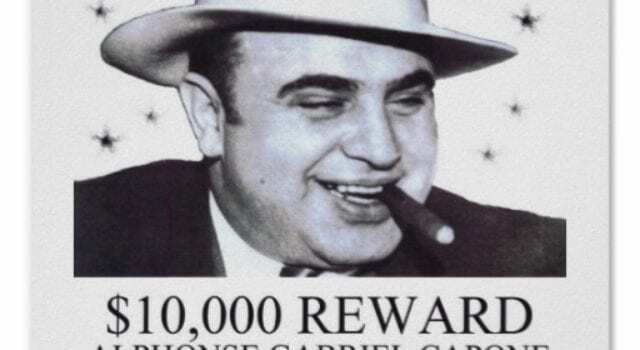 You know Al Capone’s gang pulled over $100 million a year. That’s equivalent to $1.4 billion today. Though he didn’t give speeches he was very involved in bootlegging, followed by gambling, prostitution, racketeering, and many other illicit activities. He was finally taken down and jailed for… wait for it…. tax evasion. He was found guilty of 5 counts of tax fraud and sentenced to 11 years in prison. Capone was listed as Chicago’s public enemy number one, but could have been elected mayor by a landslide because Chicagoans loved him! It seems he paid for and provided many of the soup kitchens around town! Many didn’t care what he did as long as the kitchens remained open. So maybe a Clinton/Capone ticket would be in order! Next articleIs the FBI constitutional?